ONE POUND, Collins/Allen (1914) D No. 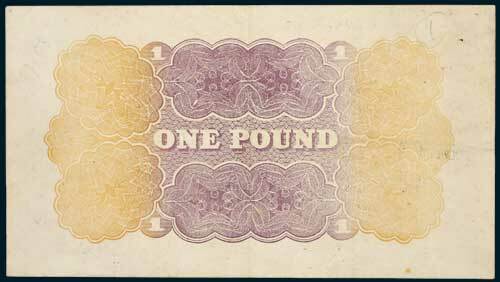 000001 D (R.20a) World War I emergency issue 'Rainbow' pound. 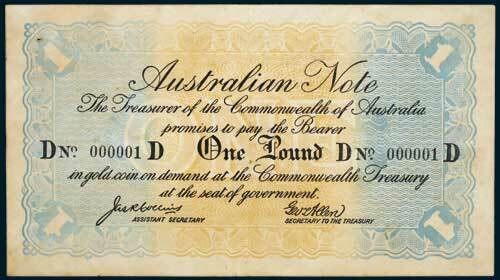 Light centre fold, pin hole at top left, slightly faded and toned, pencilled numbers on back, good extremely fine, a unique number one note, first time on the market in 28 years. Ex Spink Australia, sold privately to Amon Carter in 1977, then to Mel Steinberg and private purchase from John Pettit in 1990.